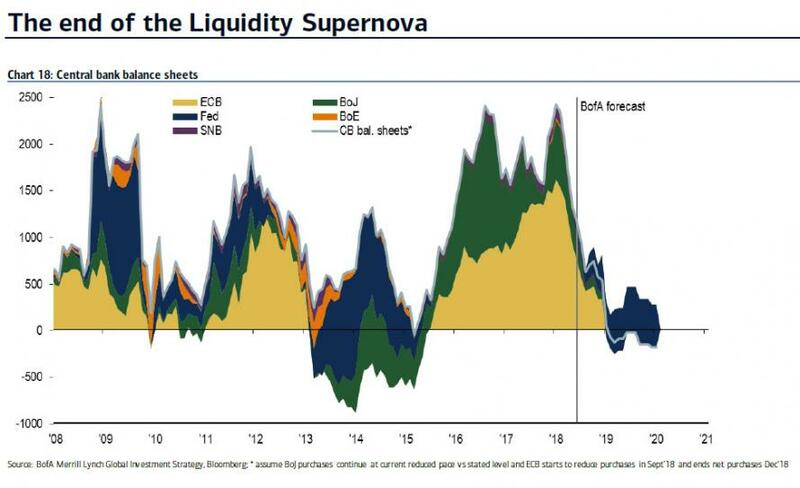 ... and the just as ominous chart showing that every Fed tightening cycle ends with an "event", a topic that was picked up yesterday also by Deutsche Bank's macro strategist, Alan Ruskin, who also took the opportunity to remind us that "Every Fed Tightening Cycle Creates A Crisis." Looking at the chart above, Hartnett also writes that his strategy is stay defensive until an "event" or rise in unemployment causes Fed to pause. 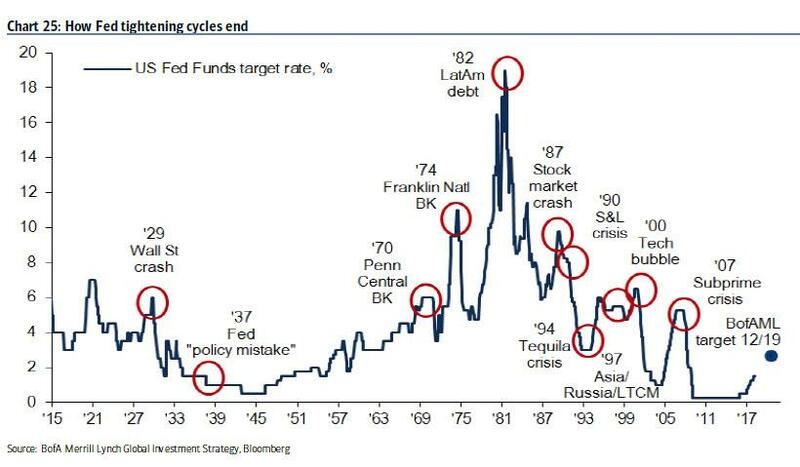 2018 returns scream Fed tightening & late-cycle": commodities 12%, US dollar 2%, stocks 2%, cash 1%, bonds -2%; annualized commodities on course for best year since 2002. 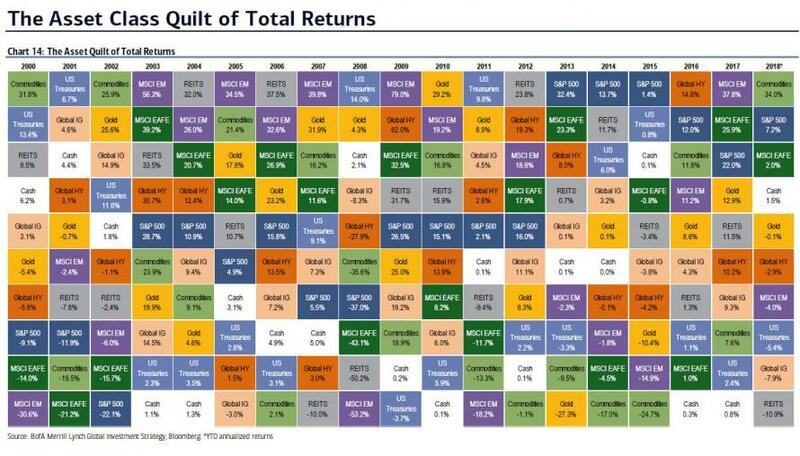 The spectacular commodity outperformance is shown below: on an annualized basis, the commodity return of 34% means that Jeff Gundlach's December 2017 call was spot on, and that this would be only the first time since 2002 that commodities were the top performing asset class. 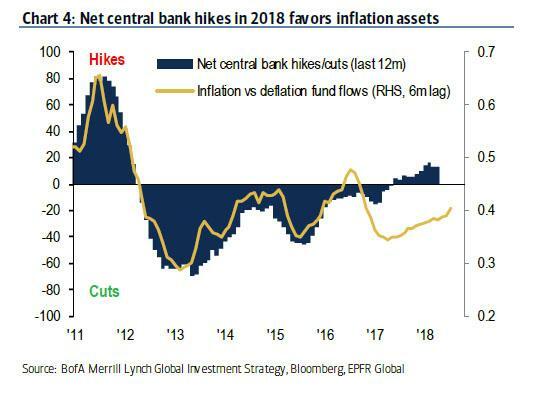 Hartnett further notes that the rise of Commodities may be just starting, as a result of more central bank hikes than cuts in 2018 "consistent with inflation > deflation flows," as shown in the chart below. note US now largest world energy producer & exporter, and GDP Q2/3 will be boosted by oil >$70...US rig count at 3-year highs, and energy capex >20% US capex. Meanwhile, perhaps a more interesting observation - if at least until this morning's surge in the US TSY which has sent 10Y yields sliding back to 2.92% - is that the market is (was?) 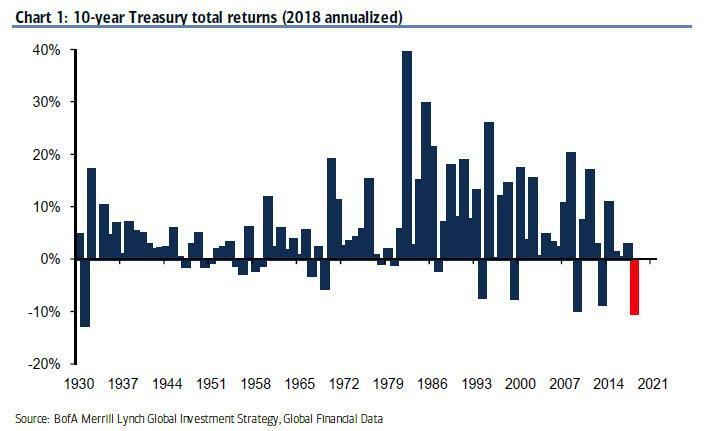 starting to get very worried about inflation/supply/funding and nowhere is this more obvious than in the return on the 10Y, whose 2018 annualized loss of -10% is the worst since the Great Depression (specifically -12.6% in 1931) while the annualized return on AAA IG bonds (-11%) worst on record. 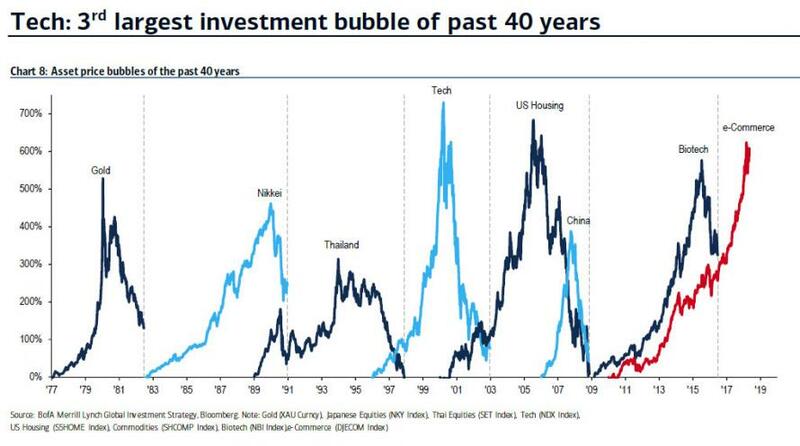 "since Q1’16 China/EM/oil crash...inflows to EM stocks = $600bn, EM debt = $200bn, EM equity + debt = $800bn, almost doubling." 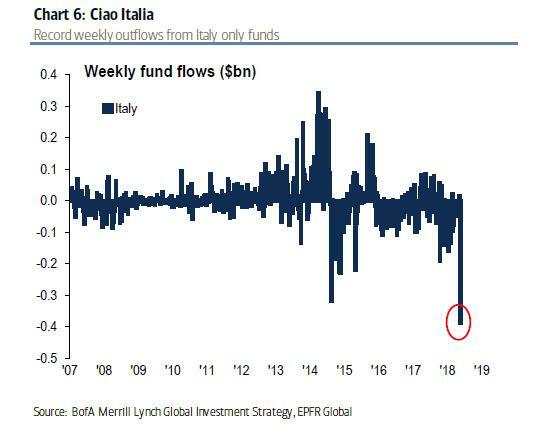 Meanwhile, confirming that investors are now boycotting Europe is that this was the 11th consecutive week of European equity outflow, amounting to $2.6 billion in the past 7 days. But nowhere was the pain worse than in Italy: according to BofA there was a record week of redemptions from Italy-only funds (6% AUM) as the BTP-Bund spread finally spiked, in a move which we previewed all the way back in December, which however is to be expected in a market which has long ago lost the ability to discount the future.